To set up your projector for monitoring and control using a Crestron Connected system, make sure your computer and projector are connected to the network. Note: If you want to use the Crestron Connected system when the projector is turned off, you need to adjust the Standby Mode settings in the Extended menu. 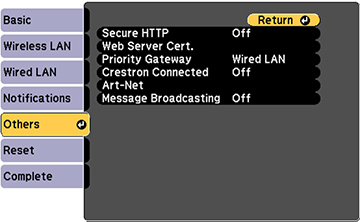 Set the Crestron Connected setting to On to allow the projector to be detected. Note: Enabling Crestron Connected disables the Epson Message Broadcasting feature in the Epson Projector Management software. Turn off the projector, then turn it on again to enable the setting.